The gift of instant gratification! Electronic gift certificates are available in any amount starting at $20. Simply choose the amount, personalize it, and send it via email. 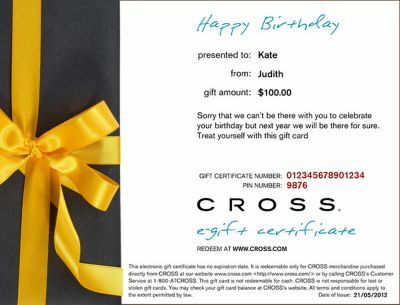 Purchasing a Cross.com gift certificate is quick and easy. Just click here to choose the amount of your gift certificate, specify the name of the recipient, the email address to which you would like it to be sent to, any message you wish to deliver with the gift certificate, then add to your cart. We will deliver your electronic online gift certificate via email to your designated gift recipient or to you if you prefer within four hours of receiving your order. You may only add one online gift certificate to your cart at a time. Cross.com electronic gift certificates can be used exclusively on cross.com or by calling 1-800-ATCROSS to purchase any of our products (excluding gift certificates). Only one online gift certificate may be used per order. Gift certificates cannot be used on any order in which another online gift certificate is purchased. During checkout enter the gift certificate number and PIN. The amount of the order will be deducted from the gift certificate balance. Purchase amounts that exceed the value of the tendered online gift certificate will require a credit card for the balance. If you have more than one electronic gift certificate that you would like to use on one order please contact customer service at 1-800-ATCROSS. We will deliver the gift certificate via email to the email address provided. An incorrect or incomplete email address will prevent normal delivery. If we are unable to deliver the electronic online gift certificate we will contact you to verify the recipient’s email address. If you already have a Cross.com gift certificate and would like to check the available balance, simply enter the gift certificate number and PIN on our account balance lookup page or call customer service at 1-800-ATCROSS (1-800-282-7677). Electronic online gift certificates are not returnable or refundable for cash except where required by local law. If you decide to return merchandise that you purchased using your online gift certificate, the refunded amount will be credited to your electronic gift certificate.